Japanese beetle. Photo by Bruce Marlin. 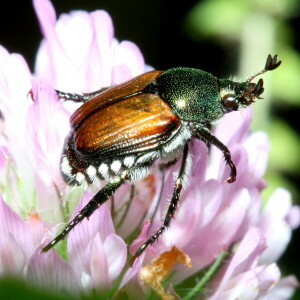 The Oregon Department of Agriculture has completed year one of a proposed five-year eradication program for Japanese beetles (Popillia japonica), a nursery and garden pest that feeds on turf as well as more than 300 plant species. The beetles were found in the Cedar Mill area west of Portland in 2016. This past summer, the agency treated more than 2,200 residences with a pesticide that kills the larvae, and also trapped more than 23,000 adult beetles. For the second year of treatment, ODA will expand the treatment area outward, but will avoid treating food-producing plants and bushes. 5:15–7:15 p.m., Monday, March 5, at Cedar Mill Community Library, 12505 N.W. Cornell Road, Portland. In January, residents in the expanded area will receive a notice in the mail with information about the treatment plans and consent forms, as well as directions for completing the consent forms online. Treatments will be scheduled this spring, in April and May. Due to the risk of moving grubs and eggs in the soil, the ODA will continue to enforce a yard debris quarantine for the Cedar Mill and Bethany areas. Residents may continue to use their yard debris bins, and landscaper staff should bag all debris and take it to Northwest Landscape Services, 1800 N.W. Cornelius Pass Road, Hillsboro. For more information, read the ODA press release or download the complete 2018 Japanese Beetle Response Plan (PDF).